The theme of Tarot of the 78 Doors is doors, both metaphorically and physically, and the spiritual keys that are used to open them. The doors depicted on the cards are versatile but they signify an entryway to new opportunities or solutions to problems. In order to pass the threshold of a door you are required to leave your fears behind and discover the secret key that opens it. Spiritual knowledge is the key and the challenge is a lock. Wisdom is what gives you access to whatever is behind the door. The majority of the cards are set in a fantasy environment with castles inhabited by centaurs and such. Some of the cards take place inthe modern world, however, and often depict medical scenes of hospitals, surgeries, doctors and alternative therapies. 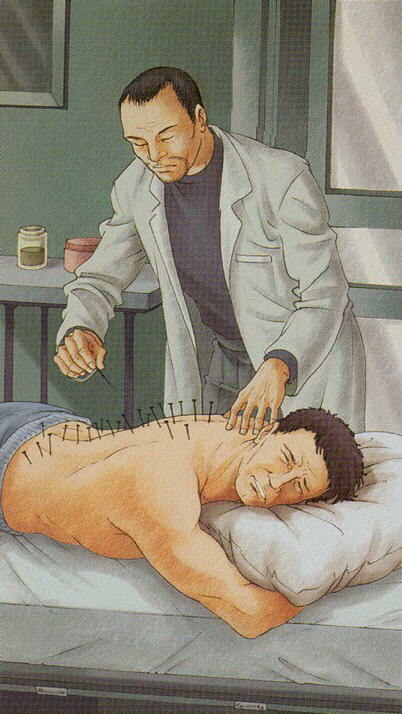 For instance, the Ten of Swords shows a patient receiving acupuncture.